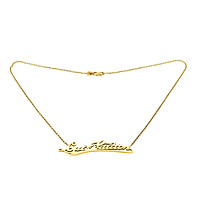 This is a striking Louis Vuitton diamond yellow gold necklace in the form of the Louis Vuitton signature in script. 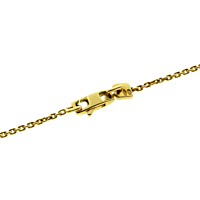 The pendant is 2.44 inches wide, and the necklace measures 17.5 inches. Two round brilliant cut diamonds dot the I's and weigh a total of .04 carats, and they are set in yellow gold.